This hike was unique in that I went with 10 people! 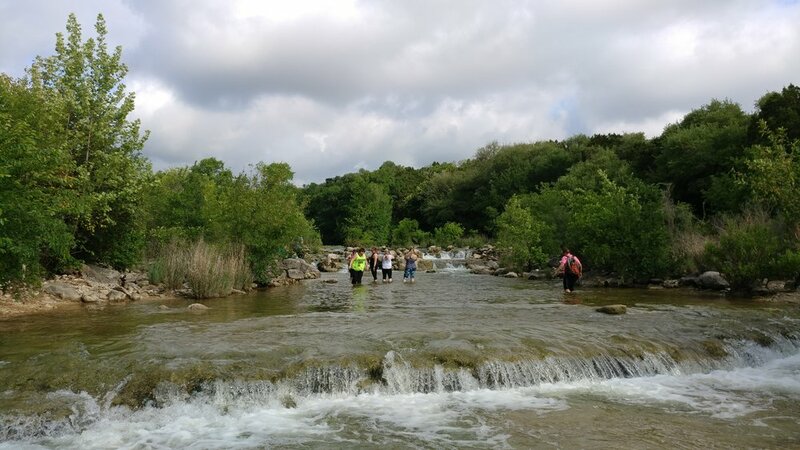 We hiked along Barton Creek, exploring all the trail off-shoots and getting our feet wet in the creek. The water was high, and flowing quickly. The trees were green, the air was mildly humid, and the sun was masked by the clouds. It was the perfect day, a great start to the morning, and a great addition to a weekend of indulgence. It's amazing to me that such a lush green area can be located in a city. Each time I visit Austin, it gets more difficult to leave. I crave that city/green life balance and you can easily jump from city street to nature very quickly. We hiked about 2 miles, I'm not exactly sure. This hike wasn't intense on the fitness, but it was peaceful and centering.